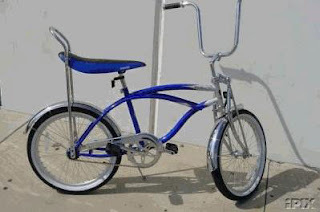 What Was Cooler Than a Banana Seat? Doug: So it's 1972, maybe 1975, and you're old enough to pedal your own way up to the local drug store. You park your totally awesome ride, which looks like the fine piece of machinery below, outside the store. You don't even consider locking it up because let's face it -- people were just more decent a couple of generations ago. You stroll inside, quarters in hand (lordy, doesn't this sound great so far?)... Today's question is, what do you come out with? Doug: We're not going to get hung up on the year -- we want this open to our readers of all ages. But think back to some books that you specifically recall buying on your own. What were they? I'm guessing you didn't know much about words like "Mint" or "Very Fine", so chances are you rolled that sucker up and stuck it in your back pocket for the ride home. What else did you buy? Did the drug store have a soda fountain? Did you get a Coke? I'm thinking probably not, as they were only sold in glass bottles back then, and dropping that on the way home wouldn't be good. How about some wax lips? A candy necklace? Doug: Below I've pictured a few books that I specifically recall buying myself. Whenever I see these covers, I am swept with a wave of nostalgia. These are specific books that bring back sights and smells, the feeling of being in my bedroom pouring over them (plotting out the next Mego tussle), of the times I cut out the corner boxes and Marvel Value Stamps, of tracing paper and of wondering why I have issue #X and #Z, but when the heck did #Y even come out? 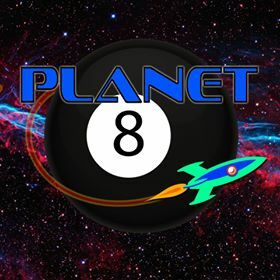 Doug: Have a blast on memory lane today! Karen: I was talking with a friend about the upcoming John Carter film, and we segued into a discussion of the work of artist Boris Vallejo. If you are of a certain age -mid 40s to mid 50s I'd say - you're probably very aware of Boris Vallejo. The man was prolific, painting amazing book covers and posters, that seemed to be everywhere in the 70s and 80s. His topics were almost always fantasy, with monsters, dragons, heroes with bulging muscles, and above all, scantily clad women. Perhaps some of his most memorable work includes the covers for Burroughs' Tarzan novels when they were re-issued in the 70s. 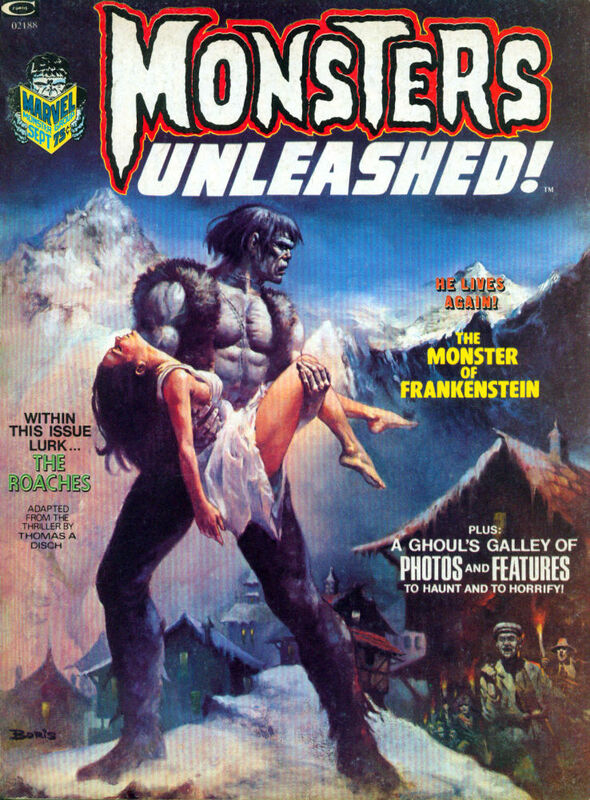 He also painted covers for magazines, including this issue of Monsters Unleashed from Marvel. So -thoughts about the man and his art? 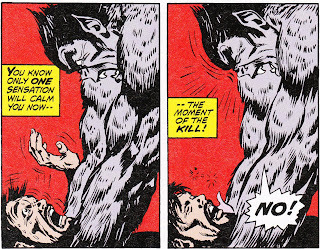 Marvel Firsts: The Bouncing GREY Beast! "Lo! A Beast is Born!" 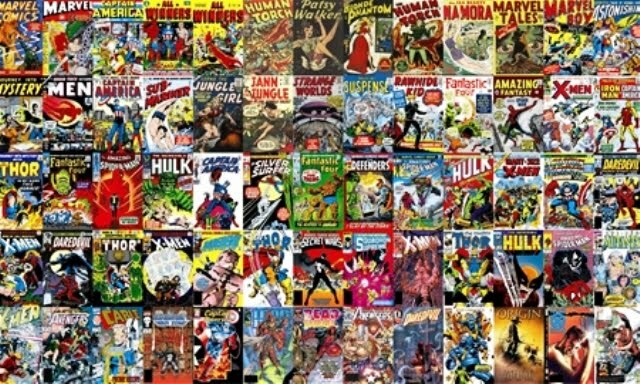 Karen: Welcome to the inaugural post in a little series that Doug and I will be running out from time to time called 'Marvel Firsts.' We'll be taking a look at the first appearance of a Marvel character, although, in the case of this review, it is a first appearance based on a new look for a character. Original X-Man The Beast got his own brief series in 1971 in Amazing Adventures, but rather than the red and blue suited mutant we all knew, he would now look much more like his appellation. 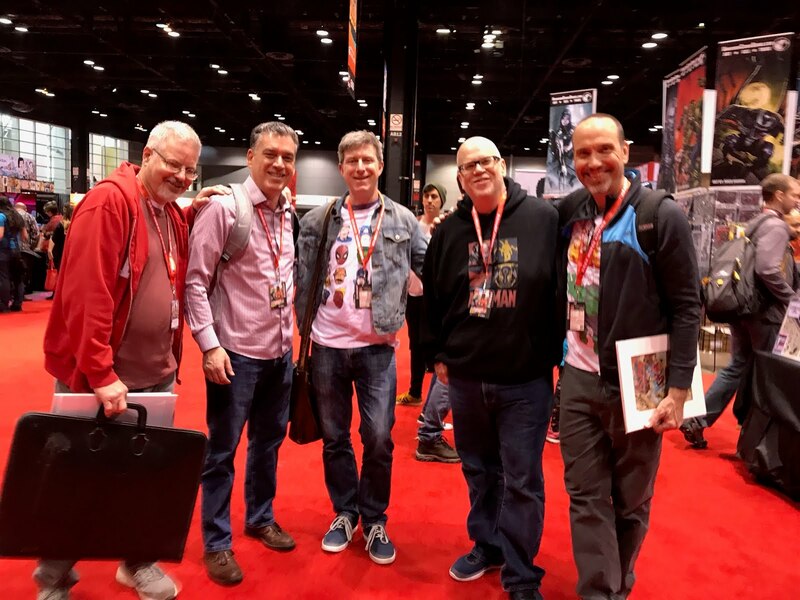 Doug: I'd be curious to see sales figures from the short time that X-Men switched to the solo format (issues 44-48); surely the issue with Hank and Bobby didn't sell better than the others. I just think the Beast was a curious case for a solo magazine. Surely the Angel would have more cover appeal; trouble there is, he really doesn't have an interesting super power. At least Hawkman looks cool with the medieval weaponry. 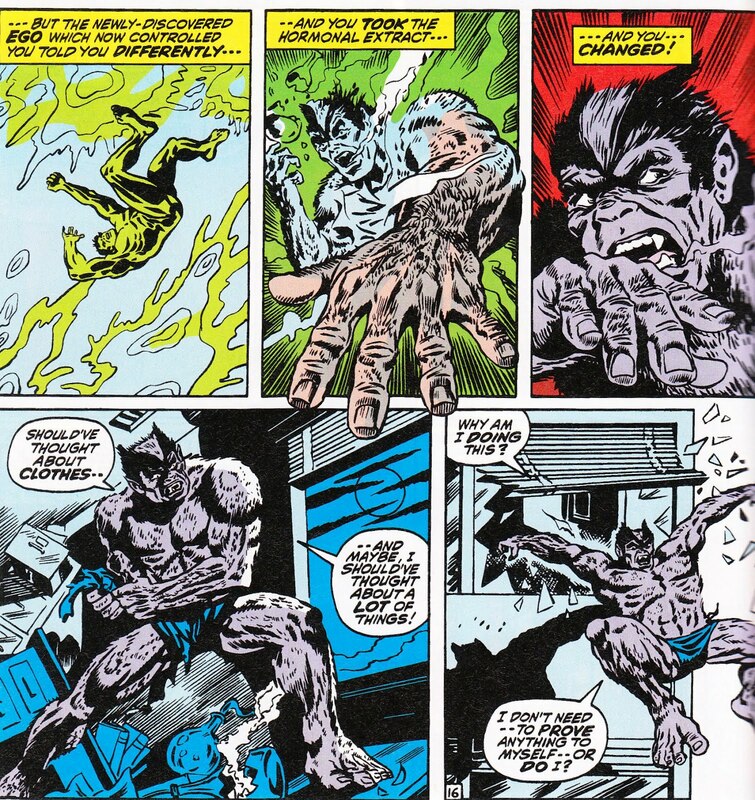 But a change in form would basically change Hank McCoy, the character, irrevocably. 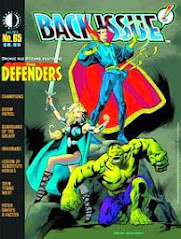 Karen: Enjoy that striking Gil Kane artwork on the cover while you can, though, because the inside is illustrated by Tom Sutton and Syd Shores, and it's rough going. 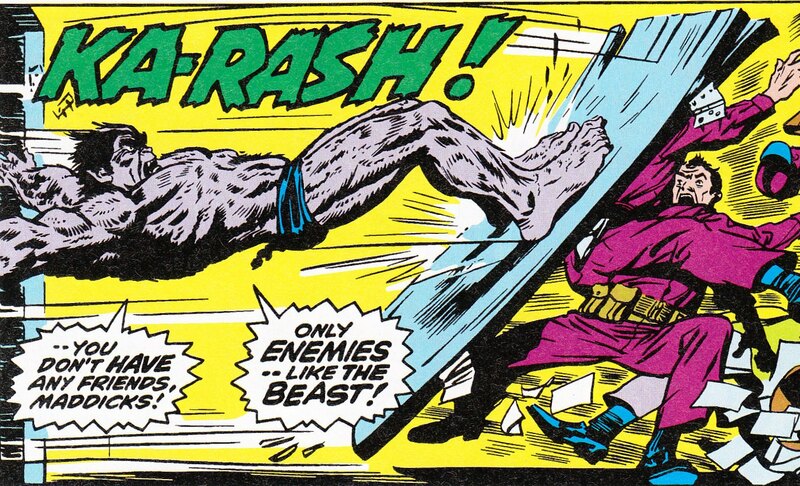 Honestly, every time I see the Beast in this issue I feel myself scowling. I actually have always liked his hairy, ape-like (not cat-like!) form, but it just looks terrible here. The rest of the art is serviceable, but the Beast in particular looks appallingly bad. Doug: Karen and I have had a few conversations through email ahead of today's publication of this post. To be honest, neither of us has been looking forward to the art. And I can't really put my finger on it. I'll agree that it's serviceable. 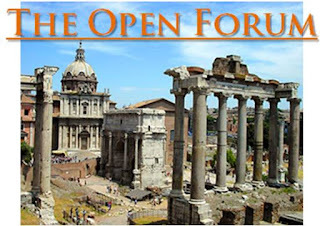 The "humanoids" (for lack of a better term) hearken back to the X-days of Wern er Roth. That's not a bad thing, just not up with some of the other Marvel mags of this day. One thought I told Karen was that this book looked at times like a pre-hero Atlas mag. Specifically in regard to Sutton's depiction of our hairy protagonist, my impression is that he never got comfortable with the Beast's look -- at times he resembles (I'm talking angular aspects of the body mainly) a gorilla, a werewolf, and at others a plain ol' wolf. There are certain postures that seem to run inconsistent even from panel to panel. But overall the lay-outs and camera angles are varied and there are some nice panels throughout. Karen: This issue came out at the time when Marvel seemed to be struggling to figure out some way to use the X-Men. Their own title had gone into reprints, and the strangest teens of all would occasionally show up in other titles. Apparently it was felt that the Beast might do well, if there were some changes. I can't help but think that his new look was a part of the whole monster mania that swept through Marvel in the early 70s. 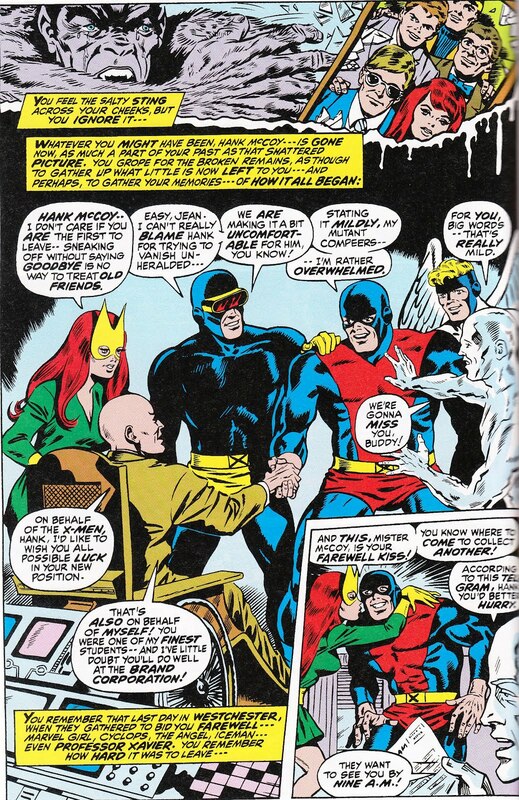 Doug: As an aside here, I am reading from the Marvel Masterworks - X-Men, volume 7. Marvel did a great thing with volumes 7 and 8 in this series by reprinting the interim appearances of the Merry Mutants between X-Men #66 and G-S X-Men #1. 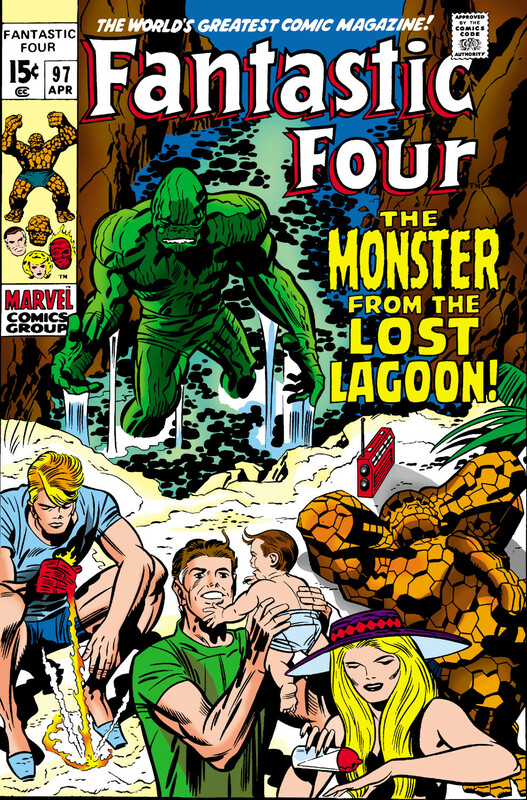 The book I'm looking at, for example, contains Amazing Spider-Man #92, Incredible Hulk #'s 150 and 161, Marvel Team-Up #4, and Amazing Adventures #'s 11-17. It's a cool book! I'm not going to buy the MM volume 8, as I have all of those issues reprinted in other formats. Karen: Our tale opens in the dark of night at the Brand Corporation. From high above a bestial humanoid gazes down on an unsuspecting nightwatchman making his rounds. When the watchman gets to a door marked "Genetic Research Subdivision 12" the man uses a device to burn through the lock on the door. Just as he's about to enter, the shaggy watcher jumps down on him. The monstrous attacker slams the watchman/spy into a piece of machinery, and the spy pulls a gun and fires. The bullets hit him in the chest but still the creature keeps coming. He disarms the man but is then attacked by more guards. He high tails it to another lab but hears the guards fire on the spy and he knows the man has been killed. He feels filled with guilt. Doug: Early here we're not completely certain that this Beast is Hank McCoy, so this display of nobility... well, if sorrow qualifies a guy who just attacked another guy as noble -- is a bit of a head-scratcher. 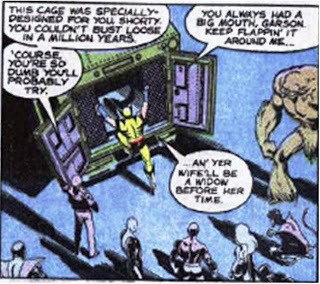 Karen: We soon learn that our protagonist is indeed the Beast, aka Hank McCoy, but he has undergone some intentional metamorphosis. 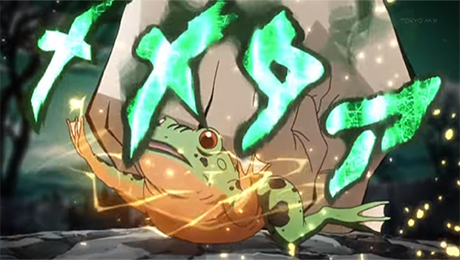 However, he soon finds that he is unable to turn back to his human form. He 's stuck in his hairy form. Anguished by the turn of events, he trashes his lab and we get a flashback (isn't that how it always works?). He recalls leaving his team-mates to go work for the Brand Corporation, a gigantic company. On his first day there, he's given a tour and meets both the attractive Miss Linda Donaldson and the belligerent Professor Maddicks. Hank soon starts seeing Linda and he's over the moon. Doug: I really liked the flashback scene to the day Hank left the nest of Xavier's School for Gifted Youngsters. 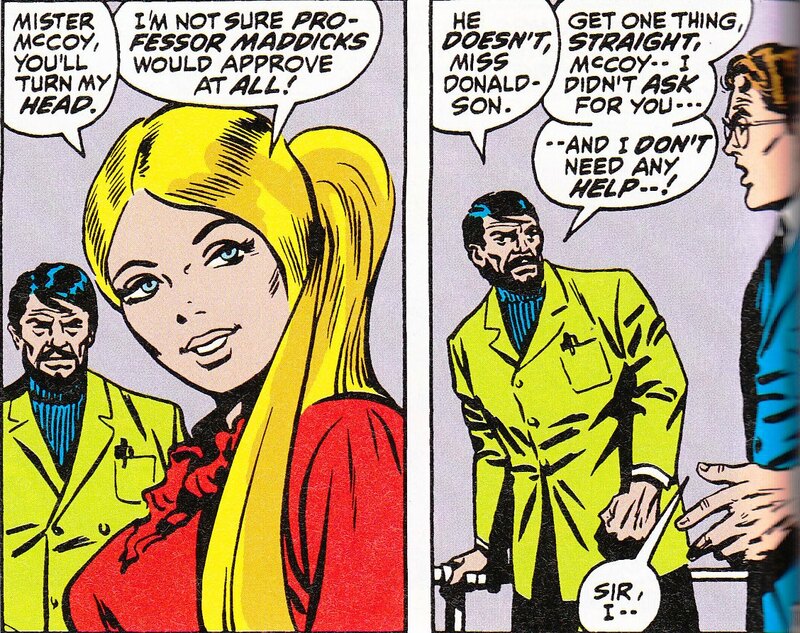 Gerry Conway made that a tender part of the tale, and as I said above about Sutton's art these panels really took us back in time. It is always a bit over the top, however, when we see our heroes all dressed to kill in their leisure time. Doesn't anyone own a pair of Levi's? Karen: It was a nice scene, and helps to provide a reason for Hank's leaving the team. It is kind of funny though to see them all in their costumes as Hank drives off. Doug: I enjoyed the new cast for their stereotypical natures. 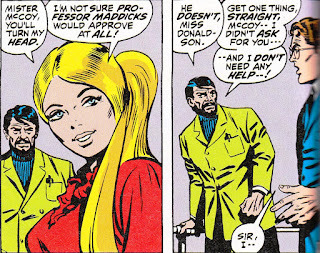 Professor Maddicks is a throwback to some of the commie nasties of the Silver Age, and Linda is appropriately pretty and smart. I also enjoyed the pages with Hank getting around town a la Spidey or DD, flashing the red-and-blues. I always liked that costume. When X-Factor began the costumes they wore were a nice homage to the "graduation costumes" of the latter years of the original five. Karen: Hank's work involves the study of his own genetic structure. He's trying to isolate the cause of mutation. He has a breakthrough and discovers a way to turn any human into a mutant - "for a carefully controlled period of time." When I read this I really wondered why Hank would want to do this. It doesn't make much sense to me. Hank overhears Maddicks on the phone telling someone named 'Agent Nine' that Hank is on to something big, and they arrange to break into Hank's lab. Hearing this, Hank feels desperate. He's afraid if he shows up in his X-Men gear, his identity will be revealed -because of his unusual build. So of course he decides to drink the chemical extract and mutate further. I guess it was one of those, "It seemed like a good idea at the time" choices. Karen: Yeah, it's more than a little weak! 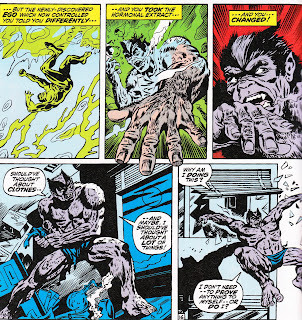 Hank drinks his serum and transforms into a still hulking but now grey-furred Beast. There's some indication that he may also have lost some of his intellect -he notes that he's no longer talking in polysyllables all the time. And then we're back to the present, with Hank once again growing angry over his inability to return to his human or at least human enough form. He recalls that Maddicks was going to meet Agent Nine at midnight, and as the clock strikes 12 the Beast bursts through the window to find him. He knocks a door off its hinges easily and begins pounding a half-dozen armed guards. 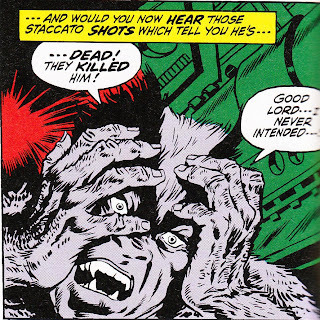 Another interesting bit here: when the Beast is shot, he seems to recover almost instantly. I got the impression he had a healing power similar to that other wild X-Man, Wolverine -but of course, this was a good three years before we'd see that pesky mutant. Doug: Hey, in my reprint of this story, the Beast is heading towards purple. You ever see a Daredevil with Killgrave the Purple Man? Like that color. Not a becoming look. Speaking of his intellect, there is a concerted effort on Conway's part to animalize Mr. McCoy, so the speech patterns decline in the smarts department. But it's not too bad. You want bad? How about what Walter Simonson did to Hank in the aforementioned X-Factor when he traded a return to plain old skin for Hank's brain? Rather than being animalized, Simonson vegetableized him. Not a fan. Doug: As you mentioned, the healing factor was noticeable right away. Hank took quite a few bullets as well as a lot of other damage. This was an origin story of discovery for Hank and his readers alike! Karen: When the Beast finally reaches Maddicks, he goes nuts and nearly strangles the man. He manages to stop himself in time but is alarmed at how wild he's become. He leaps off into the night, leaving Maddicks alive. But not for long -Agent Nine shows up and shoots him. And who should Agent Nine turn out to be but Linda! Doug: Linda! All is not what it seemed! Oh, the intrigue! By the time this was over, I struggled a bit with the question "who is Hank McCoy?" I just wasn't certain. 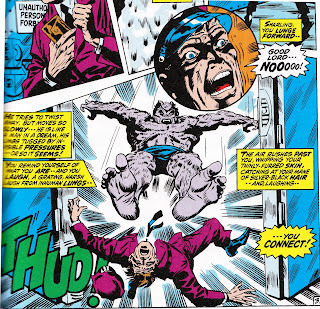 For most of Conway's script, at least the middle part, it was the Hank last seen in the Roy Thomas days. Now he looks different, sounds different, and certainly behaves differently. My first impression really wasn't all that favorable. What do you think -- is the only thing that separates this character from Werewolf by Night or the Man-Wolf is that backstory of the X-Men? Because I'm thinking they could have just made up a whole 'nother dude for this. Karen: They seemed, at least in itially, to be going for that whole "struggling to remain civilized" thing with the Beast. I'm glad that was dropped at some point. I much prefer the idea of the brainy guy trapped in the monstrous body. I think I would have enjoyed this tale a lot more if I wasn't cringing at the art. Sure, it doesn't make a ton of sense, but it moves along nicely and I'm sure it was an interesting direction for the character at the time. Doug: You're right. In proofreading our comments (because we want to look good for all of our readers), it sometimes seems like we're complaining, but I think we're really just reacting to how different this depiction of a favorite character was. And I guess as we look at this through the lens of history, it's not only the X-Men's Hank McCoy at issue here, but the guy that became a favorite in the Avengers as well. 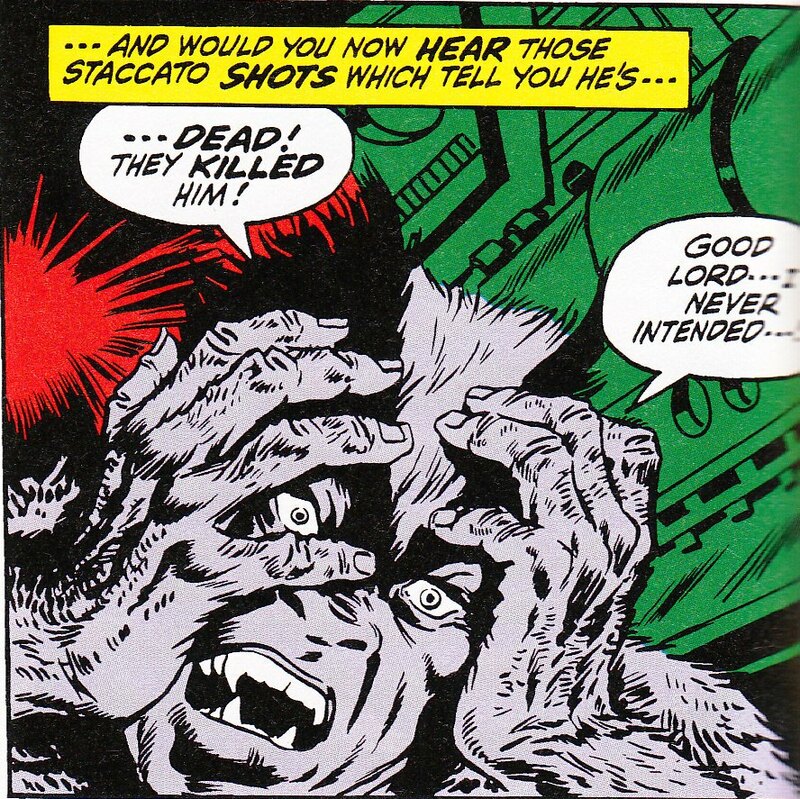 I can say that since I now hold this series in my hands, I will be interested to see where next issue's scribe, Steve Englehart, takes our now-furry mutant. 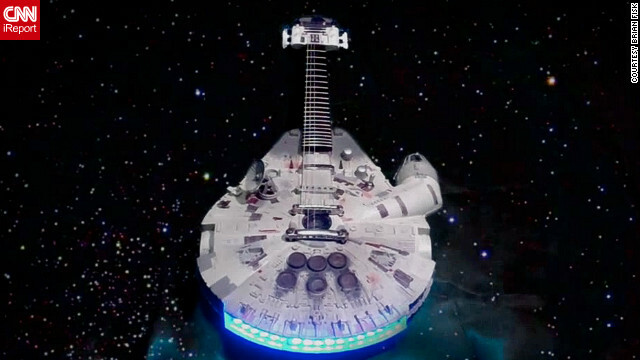 Is This the Coolest Axe Ever? Doug: You can read about this awesome guitar here. Doug: Today's query plays off a suggestion made by frequent commenter Richard a couple of weeks ago during our request for creativity. I'm doing a variation on his "lifeboat" suggestion. Doug: So it's smack dab in the middle of the Bronze Age. Your mom has been on your case for weeks to clean up your room, pick up your shoes, give the dog a bath, and yadda yadda yadda (yeah, I know that's a Dark Age line). So you're mad, you say you don't have to stand for the constant nagging, and you pack a knapsack -- out ya go. 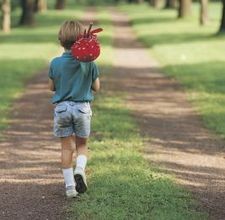 Here's today's question: what do you put in the knapsack? Doug: This one comes with rules, and here they are. No cheatin'. You can pack -- one writer, one artist, one ongoing comic book series, one toy (you didn't have to actually own this toy as a kid), one candy bar (ya gotta eat), one song, and one television program. Fill us in -- who or what did you choose and why? Doug: Frequent commenter William dropped a bomb on us back on the 11th, when in the fave book post he declared that he owns a nice-looking copy of Amazing Fantasy #15. 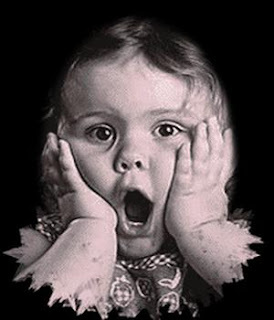 And I'm like, WOW!! How cool is that? Then a couple of days later Fred Hill told us that he'd purchased Amazing Spider-Man #129 back in the day for the outrageous sum of... 21c!! Double-WOW! And, like many of you do out there in comment-land, it got my imagination to rolling. So I'm thinking of my own treasures, and there aren't many any more as I've sold off most of what had any value at all. You most likely wouldn't even accept some of the stuff that's left, if I gave it to you! Doug: So here's today's topic -- what is the most valuable item(s) you either own, or at one time possessed? You can feel free to interpret "valuable" as monetarily lucrative or sentimentally significant. For me I have a few prizes left, none of which are in mint condition. 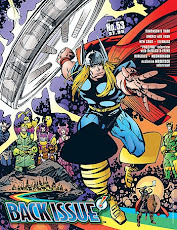 As part of my complete run of the Avengers, I of course hold copies of #1 (Good/Very Good -- if I'm honest with myself, it's closer to Good, but it's complete and in decent shape), #4 (VG), and #57 (NM). Over in the Amazing Spider-Man box, there are VG-F copies of #'s 39-40 (one of them, can't recall which one, has a bunch of thumbtack holes in the top of it. Seriously?? Who the heck would hang a book up?). And, I have Fantastic Four #'s 48-50. The best of the three is #49, which is in F/VF (closer to Fine). Let's hear about your treasures! And oh -- just in case you were feeling a little too good about yourself, check out this guy. Did you see this in the news?? Karen: The two best science fiction anthology shows of all time: The Outer Limits and the Twilight Zone. Which is your favorite? Both have their own special flavor. TZ and Rod Serling specialized in tales with the ironic twist, while OL seemed more melancholic. TZ had a cool-cat host in Serling, while OL had the omniscient Control Voice (the late Vic Perrin) -and of course, a fantastic menagerie of monsters created by Wah Chang and others. Both featured some terrific actors and memorable theme music. Karen: Persona lly, my vote goes to Outer Limits. It just captured my imagination in a way Twilight Zone didn't, and I'm sure that as a child all of those terrifically weird monsters were a big part of that. But when I go back and watch episodes now, as an adult, I get a lot out of them, beyond the monsters. My favorite episode is "The Architects of Fear," featuring Robert Culp. This is a story that manages to take two of mankind's strongest emotions -love and fear - and show what each of them can compel men to do. The alien suit, worn by Janos Prohaska, is still utterly inhuman and disturbing. Karen: But Twilight Zone must get its due, as one of the most influential scien ce fiction programs of all time. The show was well-written and every aspect of the production was solid. There are many memorable episodes, but one of my favorites, "Time Enough at Last," featured Burgess Meredith in a position all of us readers can appreciate. Karen: So, if you have to choose, which show is it for you? 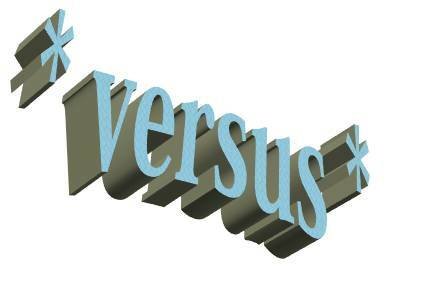 Doug: It's been a long time since we've had a good, ol' fashioned Versus! Today we're going to ask you about five books that suddenly had a guest-star thrust upon (or within) them. Of the five, which was your favorite, which would be non-favorites, which worked better with the line-up change and which should have been left alone? For your musing, we've provided the last cover under the old title and the subsequent change the following issue. Of course, in all but one case, the new resident had been in, well -- residence for some time prior to the official renaming of the book. Have at it! Doug: Shoot-out is right, kiddies! 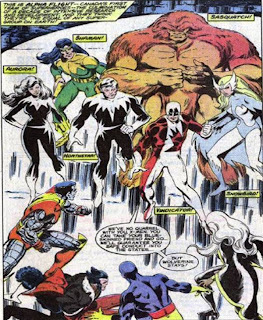 Today's fare is one big brouhaha, pitting our not-so-merry mutants against those novice heroes from the Great White North, Alpha Flight! So why waste any time? 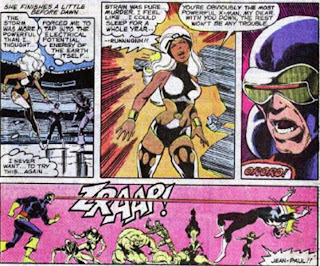 Doug: As we open, Cyclops, Colossus, and Storm are now in full costume and breaking into the Calgary Stampede -- a large fairgrounds-type area. The blizzard we saw in last week's book appears to be over, and the X-Men have been scattered -- Wolverine and Nightcrawler were captured last issue by various members of Alpha Flight, and Banshee (now powerless due to events in X-Men #119) is hanging with Colleen Wing and Misty Knight. 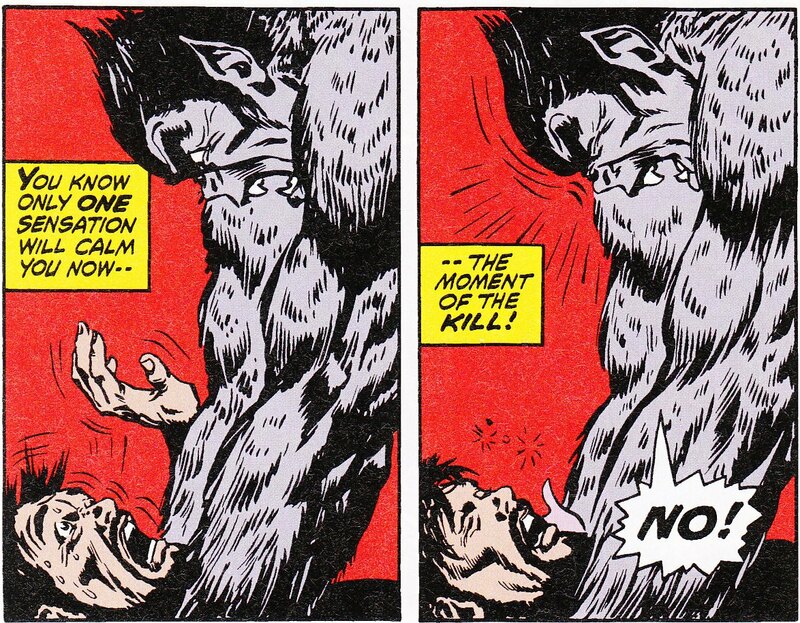 Cyke blasts some doors open, and is admonished by Colossus for the property destruction. 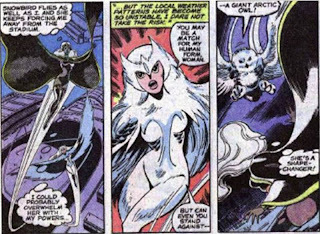 See, that's just a nice bit of characterization, a theme we've continually come back to in this 3-issue look at the foundations of Alpha Flight. Once inside, Cyclops' thoughts wander to the events of the past day, serving as the obligatory recap of the last issue's events. Doug: Ororo has flown ahead on reconnaissance, looking for Kurt and Logan. Returning, she calls to Cyke and Peter that she's found them, albeit apparently unconscious and bound in a large open area (the rodeo arena, I'm guessing). As our heroes arrive, they are met by an imposing team of super-beings -- this is our introduction to Canada's finest. Isn't Sasquatch imposing?? 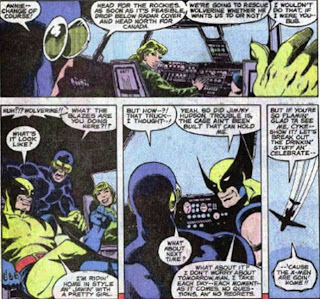 Cyclops confronts James Hudson, now known as Vindicator, and they argue over Wolverine. 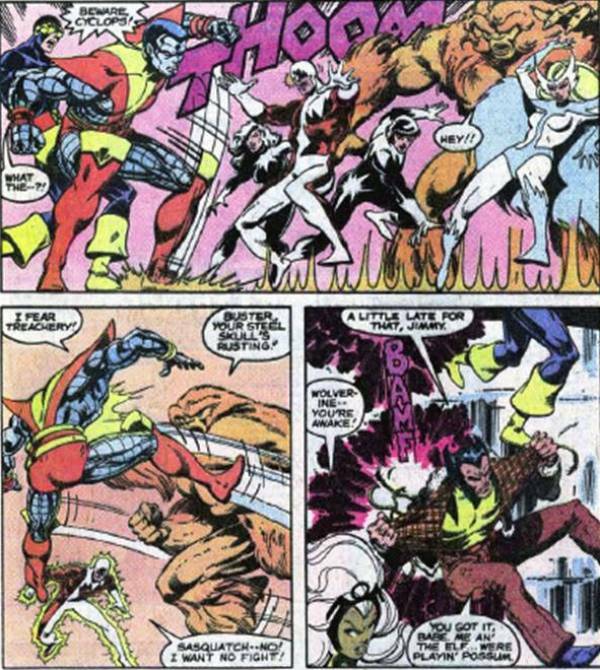 But as they bicker, Colossus is suspicious of the movements of Alpha Flight's speedster, Northstar. For whatever reason (and we are led to believe it's unfounded), Peter thinks Northstar is maneuvering behind Cyke's back. Taking a page from the Hulk, Colossus stomps the ground and creates a shockwave. Well, now everyone's edginess comes to the fore and it's game on! Karen: It's a fantastic group shot, and yes, Sasquatch, who looks like he may be punching his fist in preparation, does look very intimidating. I think it's interesting that just before our X-trio encounters Alpha Flight, Peter questions the rightness of what they are doing. If Wolverine is wanted by his government, is it right for them to go after him? That is the kind of thought I might expect from someone who has lived under totalitarian rule. Cyclops dismisses it, saying that Professor X would never have admitted Wolverine if he was a criminal. No, but he would admit a homicidal maniac! But I digress. Doug: The X-Men are engaged and seem at a disadvantage. 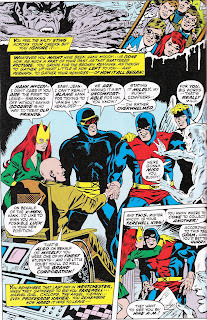 It's obvious from the beginning that Alpha Flight has some intelligence on the X-Men -- certainly Hudson had briefed everyone and they'd practiced since his scrape over a year earlier. As is typical in super-hero tussles, the main guys are by necessity depowered, disorganized, and on the verge of demoralized. But the wild card is evident right at the beginning, as Wolverine and Nightcrawler were not out, but merely "playing possum". 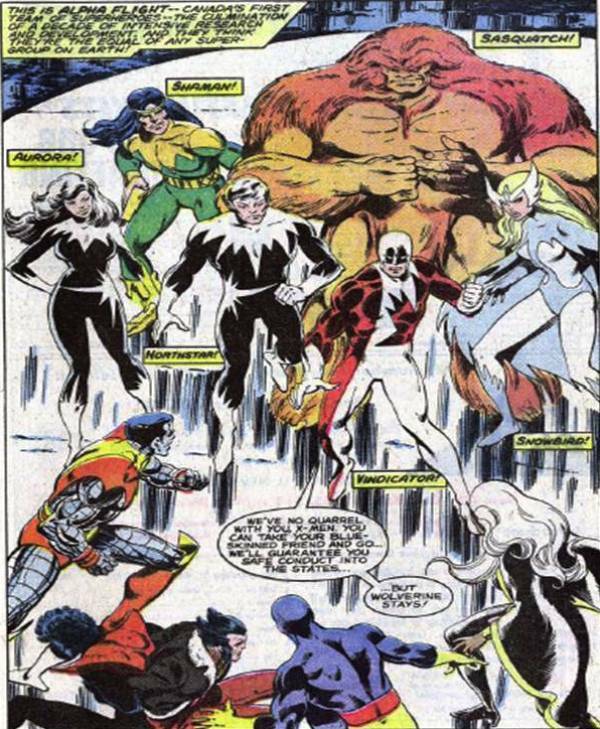 Down only Banshee, the X-Men are still picked apart by Alpha Flight. When will they learn? What do you think of this as a plot device? I can't give you a specific list off the top of my head, but it just seems like every time we do a team book the good guys come out playing like amateurs and just get pasted. Karen: We've seen this lack of team-work with these X-Men over and over again and honestly, I can't tell if it was really intentional on the part of Claremont/Byrne or not. It does seem pretty pathetic, especially considering that we see Cyclops trying to be a good leader, stressing the importance of training, but these guys are a bunch of loose cannons. There are some nice match-ups, and the playfulness between Nightcrawler and Aurora is fun. 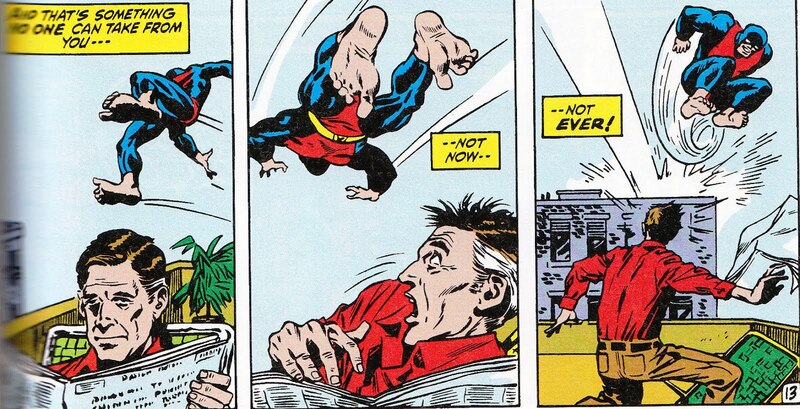 I believe Byrne slipped himself into a cameo on page 16, when the ever-growing storm blows out a window in the Calgary Tower. 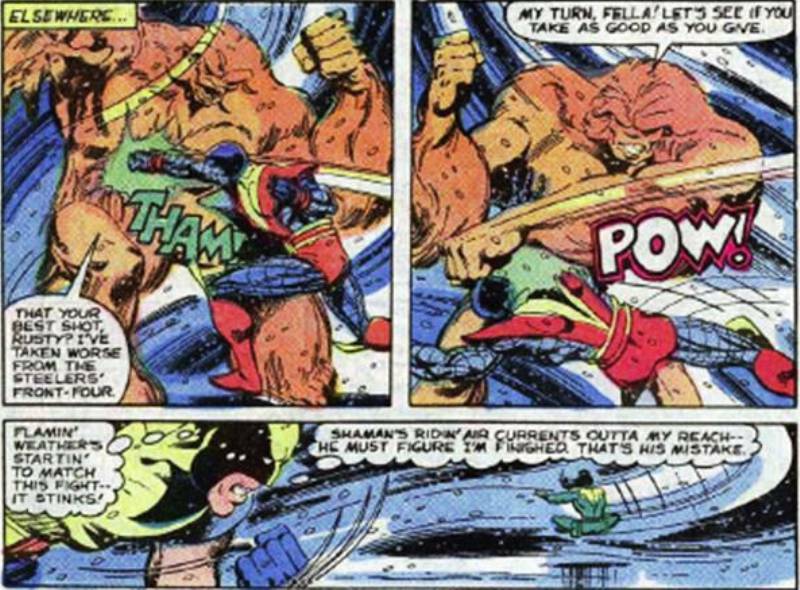 During the Sasquatch - Colossus throw down, Claremont has Sasquatch say he's "taken worse from the Steelers' front four." A fan would point out on the letters page of issue 126 that Sasquatch's civilian ID, Walter Langkowski, was a linebacker, so how could he face another teams' defense? This brings to mind the baseball game from X-Men 110 and how it was obvious Claremont knew nothing about the sport. Why include it if you don't know what you're talking about? Doug: The rest of the book is basically one big brawl. 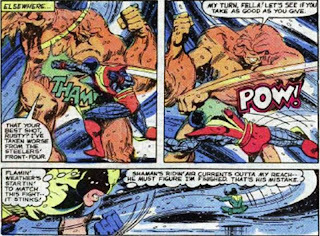 Opponents are chosen with no surprises -- Storm and Snowbird take to the air, Colossus and Sasquatch lock horns, Cyclops and Nightcrawler try to hold down Northstar and Aurora, and Wolverine tangles with some constructs of Shaman. Vindicator runs loose throughout all of this, which seems to tip the scales in Alpha Flight's favor. But as the teams duke it out, the blizzard that was a central part of last issue's plot begins to intensify, to the point that it is becoming dangerous. 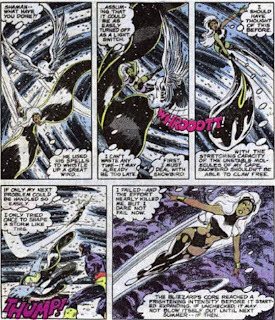 Storm is finally able to snare Snowbird in her cape, and then she flies off into the eye of the storm to attempt to squelch it. She is successful, which further reveals the extent of her powers. But as she lands, exhausted, Northstar cheap-shots her with a blow to the back of the head, knocking her out. Cyke retaliates with a knock-out beam of his own. Karen: I liked Snowbird's look but her powers never impressed me. She could transform into arctic animals. Ho hum. Storm should defeat her easily. Once again, we have an impressive, heroic moment from Storm as she dissipates the tempest. Northstar's dirty punch pretty much summed up his character for a long time: he always seemed like a punk. Scott's protectiveness of his team-mates, and pure anger, was nice to see. Doug: With the fight elevated to a less-than-honorable pitch, Cyclops picks up Northstar by his shirt and is about to pummel him when Wolverine, of all people, stops him. It's a great scene, just further adding layers to not only Logan's character but to the relationship between he and Cyclops. Wolverine tells that the fight needs to end, that it should never have gotten out-of-hand -- but that he was just enjoying the scrap too doggone much! Wolverine then surrenders to Hudson and is loaded into a specially-made van for transport. Of course the guards utter the obligatory tough-talk, and Logan gives it right back to them. 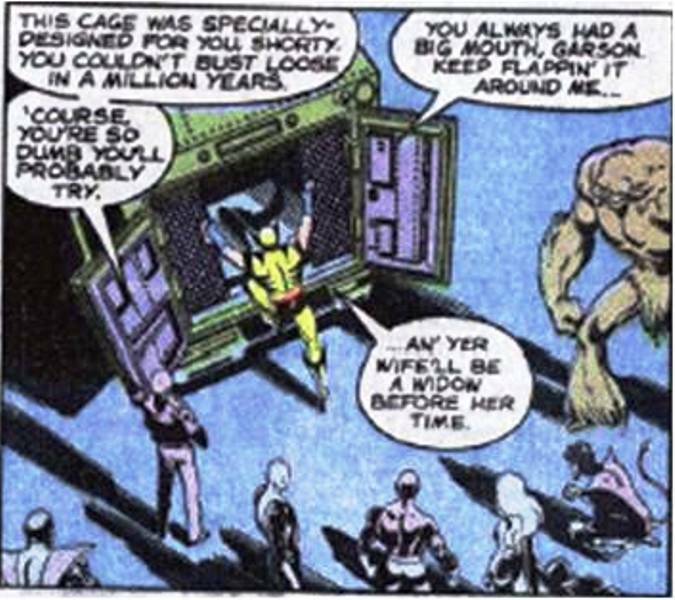 Karen: It's a nice turnabout, with Wolverine as the voice of reason. This was a character that was still mysterious and appealing. I loved the development of the relationship between him and Cyclops. It was very reminiscent of what happened with Captain America and Hawkeye back in the early days of The Avengers. Doug: In the last scene, the X-Men are on a plane being escorted to U.S. airspace by the Canadian Air Force. Cyke is raising the troops to return on a rescue mission. 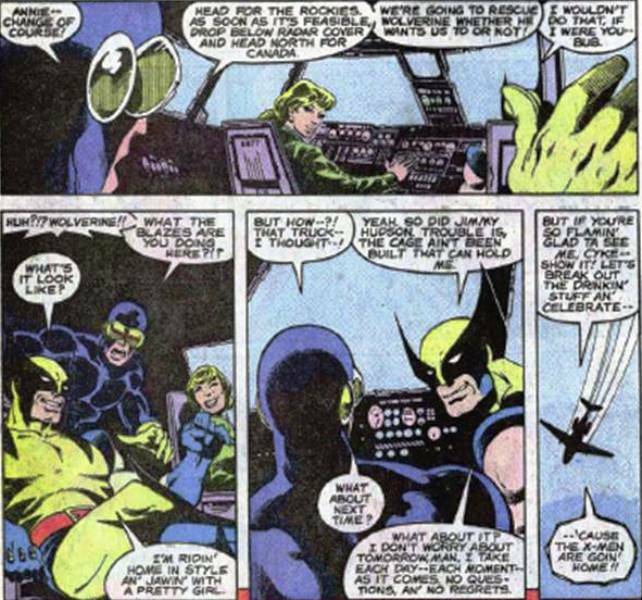 Everyone's all in, when suddenly a dissenting voice comes from the co-pilot's chair -- it's Wolverine! You know, the cage hasn't been built that can hold him! Karen: That was a beautiful ending. No need for any explanation - all you need to know is Wolverine is a bad mother! Doug: This was a fun 2-parter, I guess 3-parter if we count the first appearance of Vindicator. 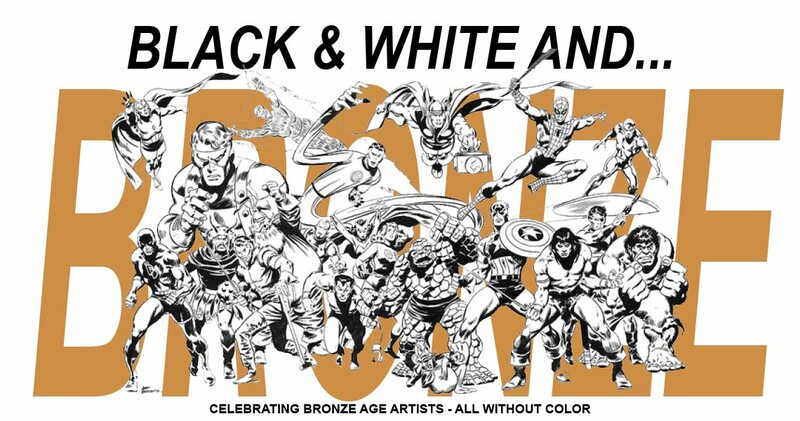 Claremont and Byrne/Austin remain on top of their collective game, and many enthusiasts would say that the best was still yet to come. That's a tough act, as what's already in the rearview mirror is pretty awesome! Perhaps the best thing about this little series was the extension of the Scott/Logan relationship. Karen: We got character growth and a tantalizing taste of a new team. What more could you ask for? Discuss: Any Vehicle You Can Think Of! It's My Favorite, and I'm Sticking to It!